2018 Queens SOUP — Apply HERE! 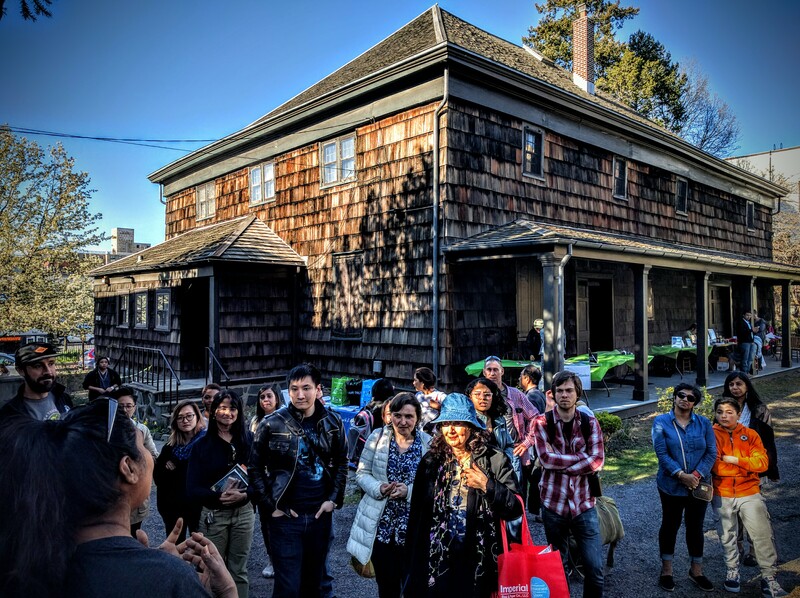 In April 2018, Queens residents have the opportunity to participate in Queens SOUP, a crowd-funded micro-granting community dinner, hosted by the Greater Flushing Chamber of Commerce. Inspired by Detroit SOUP, the Chamber raised over $800 for neighborhood improvement projects in 2016 — this spring the program is expanding to fund projects from all over the borough. 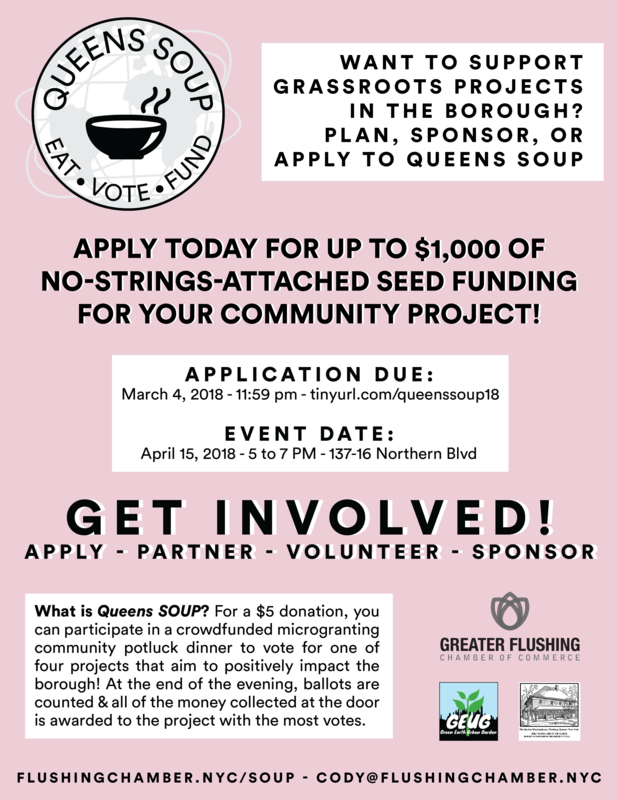 Queens SOUP provides an opportunity for any community project based in Queens to win and get no-strings-attached money from our in-person crowdfunding during our event on April 15, 5-7pm at the Flushing Meeting House, 137-16 Northern Blvd, Flushing NY 11354. 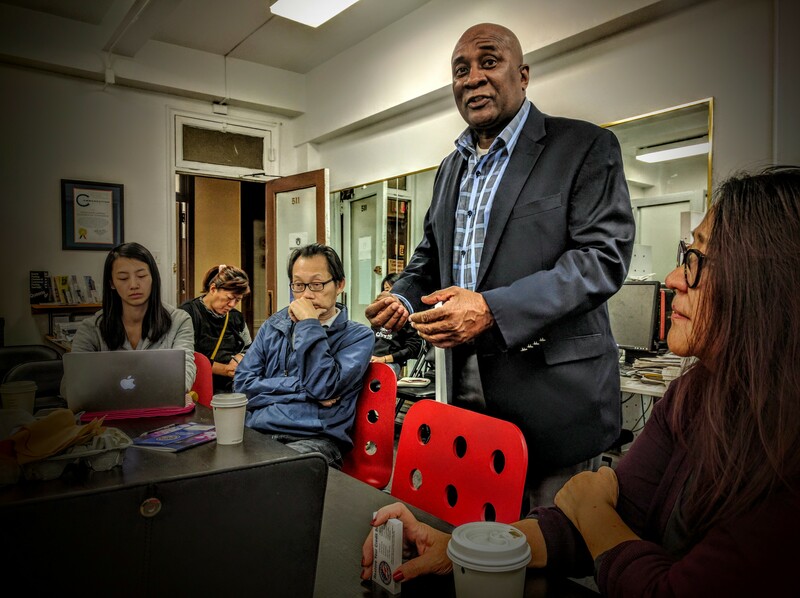 Projects can focus on arts and culture, civil rights, small business assistance, children’s programming, neighborhood beautification, environmental remediation, and more. 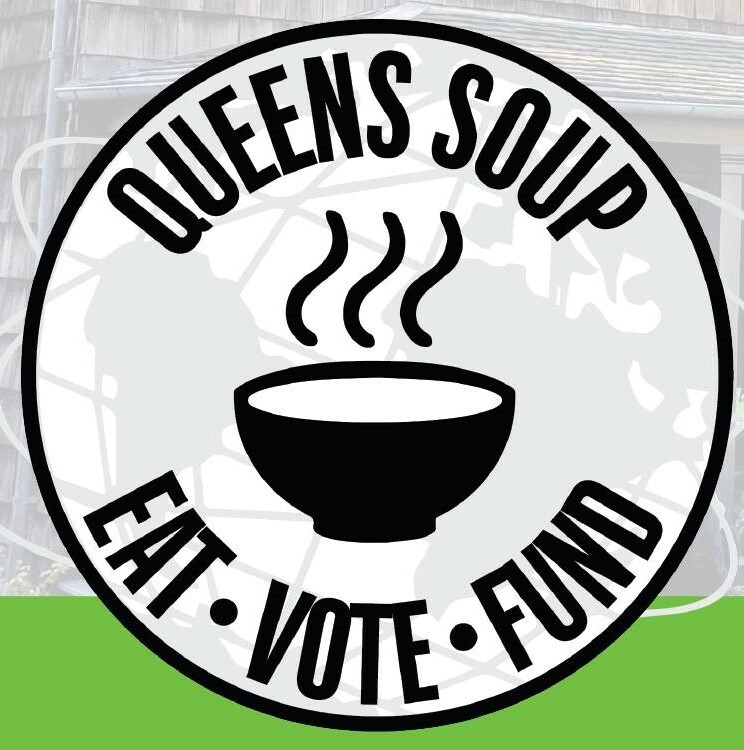 After an online application process, four projects will be chosen to present their plans during Queens SOUP. Those interested, should apply online via this Google Docs link! a public festival, show casing unique eats in Queens through a competitive cook-off featuring tastings and highlighting the benefits of local organic produce. a 6-month residency that connects playwrights to central public spaces within Queens’ neighborhoods. For this inaugural season, two local playwrights will be selected to develop site-specific play to be performed in two of Queens’ public plazas. a free 2-week Tinker Lab class in 8/17 to the children at Latimer Gardens Community Center. Tinker Lab is an innovative hands-on learning focused on technology and arts, teaching coding as an essential 21st century literacy skillset. The Chamber is seeking various levels of sponsorship and community partnership for Queens SOUP — matching funds; in-kind donations of food, supplies, or giveaway and raffle items; volunteers during the event; or participating as a vendor in our SOUP “Marketplace.” Please contact cody@flushingchamber.nyc or maureen@greenearthurbangardens.org if you have questions about sponsorship and partnership opportunities. SOUP is a community potluck dinner, originally founded in Detroit, that provides seed funding and promotional opportunities to help launch local projects bringing positive impacts to their community. SOUP events have taken place all over the country — increasing innovative, grassroots economic development and civic engagement. For a $5 donation, attendees gain access to a potluck dinner where they eat, learn, and vote for one of four projects they think will have the most significant effect on their community. At the end of SOUP ballots are counted, and the money collected at the door is awarded to the project with the most votes. SOUP acts as an unique networking event, connecting projects with potential community partners and volunteers regardless of whether or not they win the cash prize. 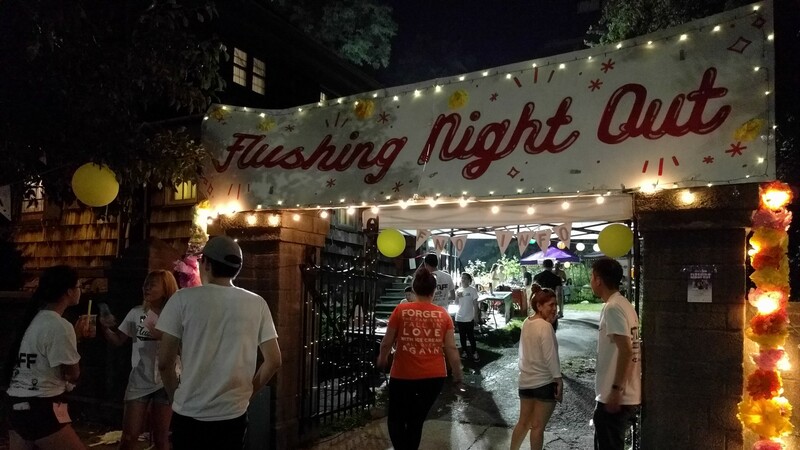 Inspired by Detroit SOUP, the Greater Flushing SOUP uses the same crowd-sourced community-dinner model to provide small grants to community projects and civic initiatives in north-east Queens. 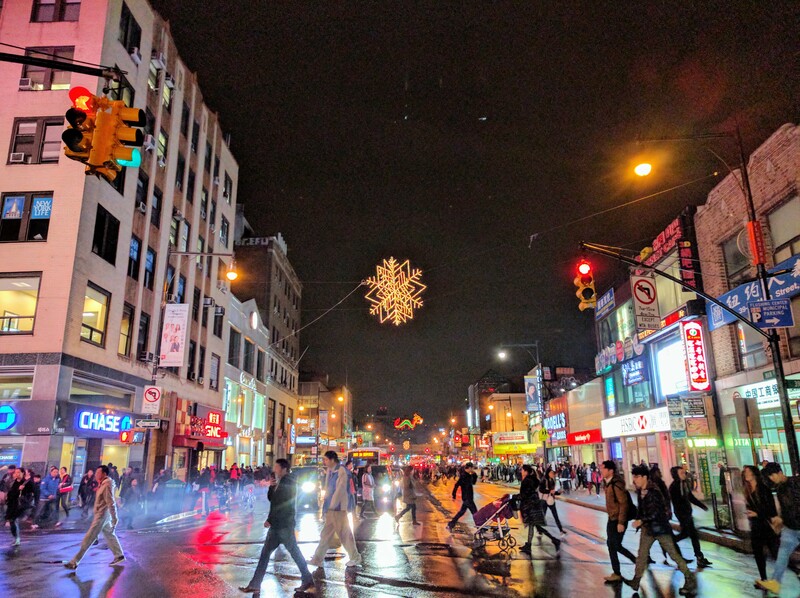 A $5 donation gets you into a pot-luck dinner where four local community groups pitch their plan to improve the Greater Flushing area. At the end of the presentations, attendees vote for their favorite initiative. The project with the most votes wins all the money raised at the door. 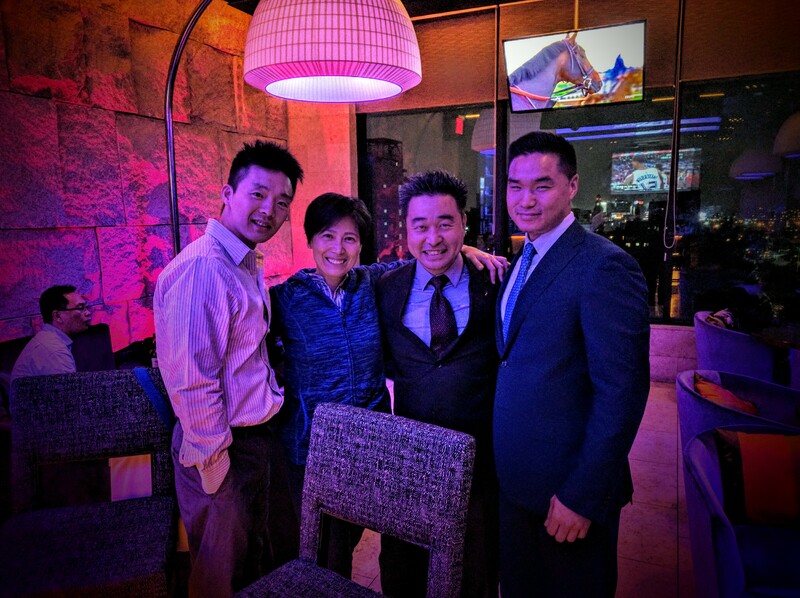 Regardless of who wins the cash prize, SOUP acts as an innovative networking event, connecting projects with potential community partners and volunteers. 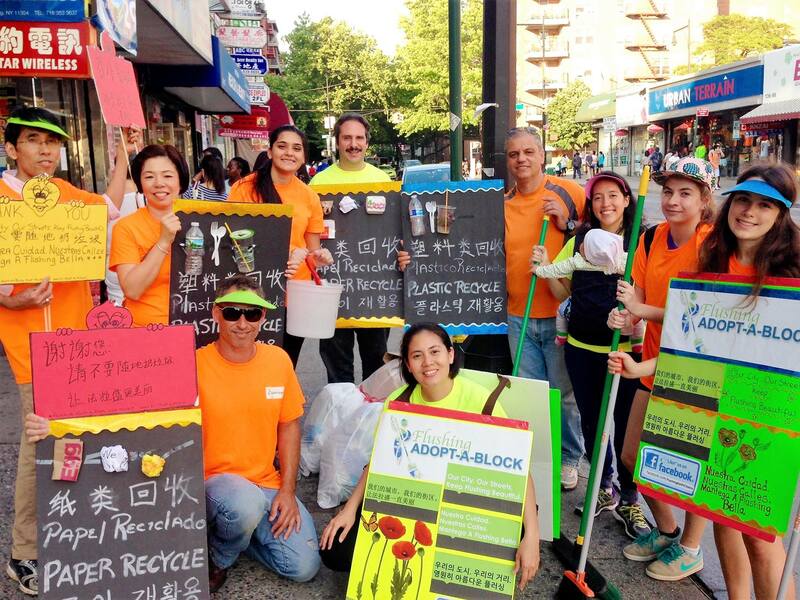 The Adopt-A-Block project was a week-long pilot project organized by Body and Brain Yoga and Tai Chi in collaboration with their charity branch, Flushing Earth Citizens, held in Summer 2016 that worked to clean up Roosevelt Avenue between Main Street and Union Street in downtown Flushing. Volunteers swept the side walks, washed down public trash cans and ad bins, and removed graffiti throughout the area, all while encouraging people to through out their trash and keep Flushing clean. 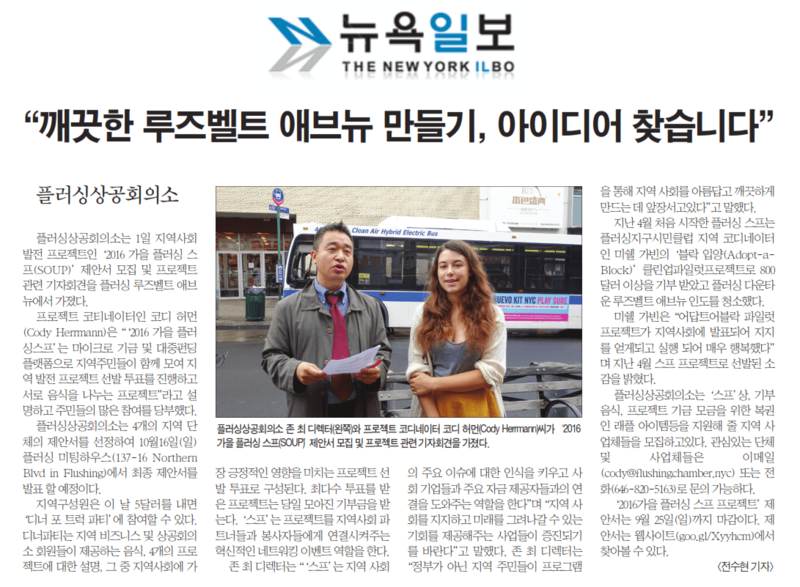 – Community Organizing Language Forums (Korean Americans for Political Advancement): Filling in the language access void in Flushing by teaching civically engaged Korean and Mandarin speakers how to reach out to neighbors on policy issues in these languages. – Bee Aware Mural Initiative (“For The Good of The Hive”): A mural located at Ganeinu Early Learning Center painted by students from RFK High School, shinning light on the issue of our depleting bee population, and its effects on humanity. 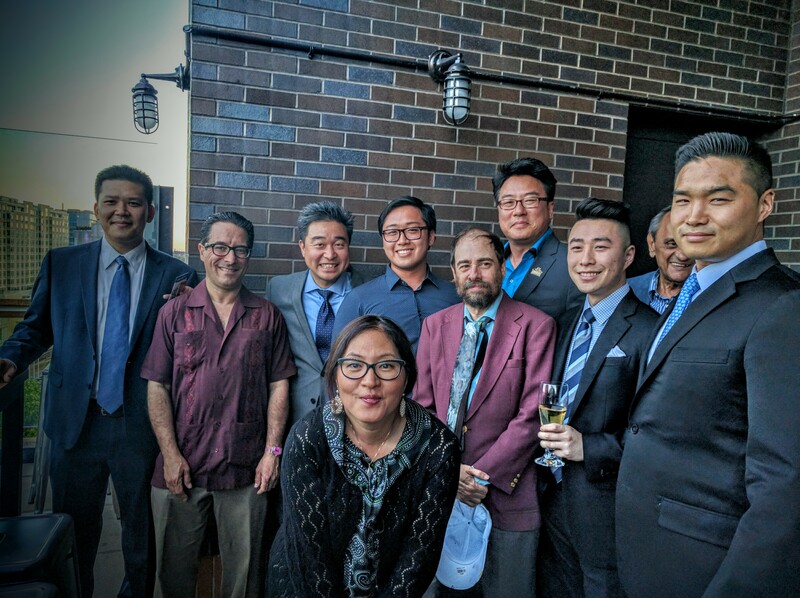 – Kick-Off event Community Gathering to Clean Flushing Bay! followed later this summer by Live @ Flushing Bay! 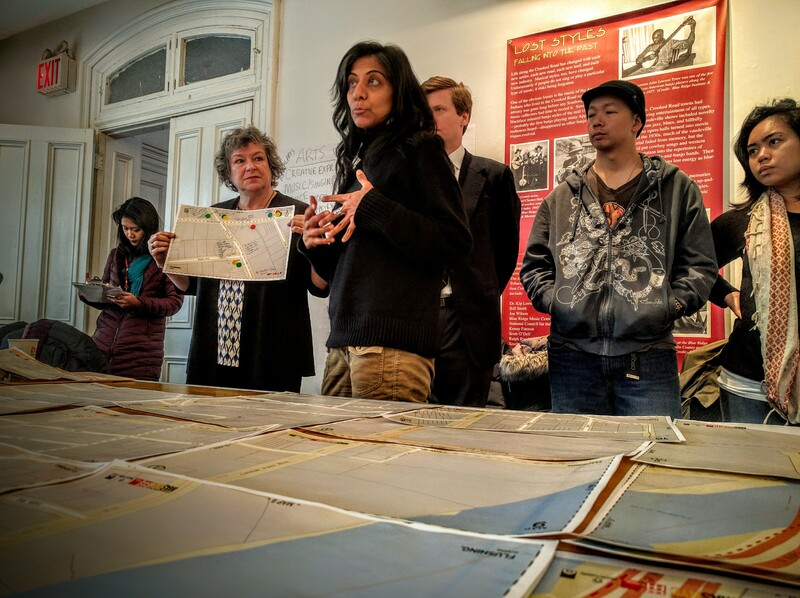 (Guardians of Flushing Bay): Mobilizing the community to stand up for improved water quality in Flushing Bay and Creek through a waterfront clean-up on May 7, 2016 and cultural programming along the waterfront. The first SOUP was held as part of an Earth Week Kickoff event which included programming, classes, and giveaways created in part by Green Earth Urban Gardens, the NYC Compost Project hosted by the Queens Botanical Gardens, Partnership for Parks, GrowNYC Zero Waste Programs funded by NYC Sanitation, Flushing CSA, Gutsier Living, Body and Brain Yoga and Tai Chi, and Susten Corp. A raffle to raise funds for the upcoming SOUP in Fall 2016, was sponsored by Hydroponic Garden Centers Inc., Neil’s Natural Market, Garden World, and TD Bank.